Quinoa Haircare Is A Thing. Since having my hair lightened I've been making sure to take extra care of my pink locks by stretching the hair wash days from every 2 to 3 (so gross but nothing a little dry shampoo can't fix until my scalp rebalances and catches up with the new routine), avoiding heat wherever possible and using my very best haircare to keep my hair in tip top condition. No sulphates or stripping, drying ingredients here. Only nourishing, shine boosting quinoa. Wait... what? 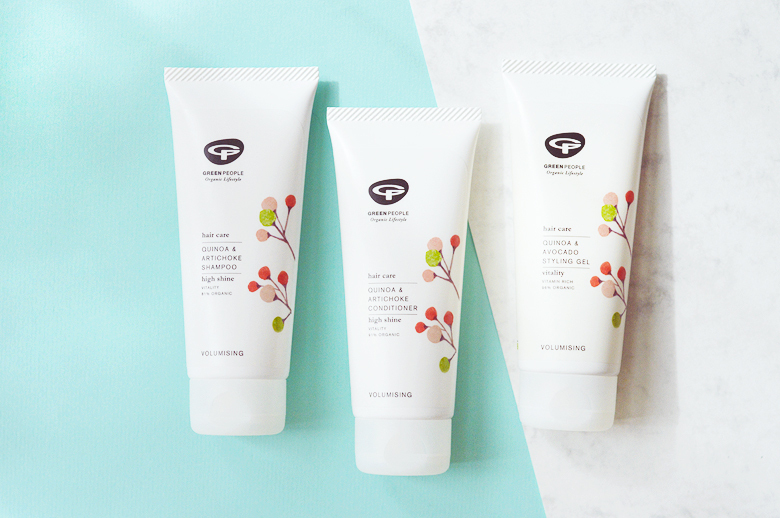 I've been thoroughly testing out the newest range from Green People recently, their Quinoa & Artichoke Shampoo & Conditioner plus the Quinoa & Avocado Styling Gel. I've seen a few ranges released this year with quinoa in the formula, so naturally I was super interested in seeing what all the fuss was about. Quinoa is protein and vitamin rich, all excellent things for your hair, and according to Green People quinoa has been shown to boost shine by over 50%. I'm not sure how you measure shine, a glitter-meter? but regardless, I'm sure we can all agree a little extra shine ain't no bad thing. Meanwhile, the artichoke leaf extract smoothes the hair's surface to keep it frizz free and a bunch of other ingredients do their thang' too (chamomile, aloe, ginger root, marshmallow etc). Starting with the shampoo, this lathers up a treat and really gets to work cleaning hair. It doesn't have that stripped feeling but I can tell my hair is very clean and it definitely needs some conditioner afterwards to soften things up again. The conditioner is light and creamy and rinses cleanly from the hair. It does a good job of replacing lost moisture and detangling any knots. The products have a strong scent of ginger and citrus. The scent comes from all natural essential oils (ginger, lemongrass, clove, lemon & orange) instead of fragrance too, which is lovely. It really lingers in the hair and if you follow up with the styling gel, which smells exactly the same, you'll be getting whiffs of ginger from your hair all day. Probably not ideal for some but I quite like it. Speaking of the Styling Gel, this is my favourite of the trio. At first I wasn't sure what on earth I was going to do with a styling gel, I really don't use styling products on my hair other than a little salt spray and leave-in conditioner, but this can also be used as a leave-in conditioner as it's full of ingredients that are nourishing and maintain healthy, glossy locks. It also offers hold as when I've used it on dry hair (and accidentally didn't work it in properly) things got a little crispy. I like to use this sparingly when I curl my hair now and just scrunch a little though the curls for hold and separation as I don't seem to own any hairspray. I've also used this a few times on my wet hair as a leave-in conditioner and I definitely noticed my hair had more swish and was really soft and glossy when dry. Do you need all three? probably not, but if you're looking for a change of shampoo and conditioner I would recommend these if you're budget can stretch (£30 for the both) and then the styling gel (£8.96) is an amazing little product all on it's own.